I barely know the woman whose dog I agreed to foster so she could go to inpatient treatment for alcoholism. We have a good friend in common. I already own two dogs. 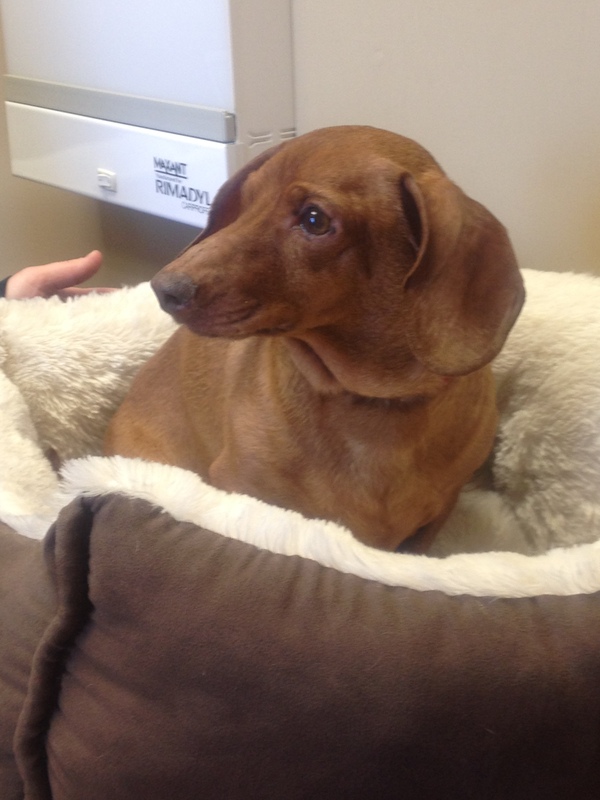 So I impulsively said “yes” when she sent out an SOS e-mail to find a caregiver for Max, her mini-dachshund. Three weeks later, Max is dead — by my decree — and I am left with an empty dog bed and the uncomfortable reality that doing the right thing is, often, a lonely enterprise. I picked up Max at his suburban townhouse on a bitterly cold Thursday afternoon in February. His owner had been drinking. Bright-eyed and chatty, trying desperately to appear normal, she apologized for the messy living room and the urine stains on the carpet. I collected Max’s things — a kennel, a tattered leash, a grocery bag full of canned dog food and pricey treats — and wished the owner well. I was eager to get out of there and get Max home. An inveterate exerciser, I envisioned getting this dog on the right path. Only 5 or 6, Max had a swaying, tentative gait that suggested he was uneasy — or unfamiliar — with a simple walk. He laid in his bed for hours and seemed to be composed of what my son dubbed “flab and bones.” In fact, the slipped disc that paralyzed him, seemingly overnight, “is often caused by obesity,” the Wikipedia site says. The pads of his feet were as pink as a baby’s bottom. When we’d lift him outside to pee — before the rear-end paralysis took away that function, too — Max would stand in the snow, frozen in place. I attached a leash to his collar once and he refused to move. I reached the owner at her treatment facility in California prior to putting Max down, and she told me Max had been “horribly abused” when she rescued him at 4 years old. I didn’t want the details — visions of hind-end kicks have haunted me since I had the dog killed last Thursday — but I ask myself whether overfeeding and inactivity don’t constitute some form of abuse as well. Bred to be hunters of small animals such as badgers and rats, dachshunds require muscle strength to support their long spines. But in an era when “sedentary” seems to define the human condition, dachshunds have become house dogs, playthings — dressed up in silly sweaters for their owners’ amusement. “Loved for his long round body and cute stumpy legs,” one website reads, the dachshund nevertheless must be nurtured with fish oil and exercise and specific handling in order to remain healthy. Maybe we need to enlarge the definition of animal cruelty: Is it only hitting? Starvation? Chaining a pet in a cold, dark basement? Or is it also ignorance and benign neglect? Maybe I’ll find the courage, finally, to do more than wring my hands and actually volunteer on behalf of abused and abandoned animals. Unlike giving birth — which is painful, traumatic and yet joyous — witnessing death is just hard and mysterious, and very sad. It’s my 98-year-old father-in-law thrashing in a hospital bed, hours before he died of pneumonia in the facility where he once was chief of staff. It’s my sons’ godmother, my sister-in-law, lying in a hospice and progressively losing the ability to talk or breathe. “It’s not all puppies and kittens,” she replied. My family did that for Max. Dr. Signe Wass of Countryside Animal Hospital did that for Max. And in her own way, his owner did that for Max, too. She rescued him, and loved him the best she could. This entry was posted in Family and tagged animal cruelty, Animal Humane Society, dachshunds, Dogs, euthanasia, pets on March 8, 2015 by Amy Gage. Here I am sitting in the California sunshine crying over a little dog I never knew. That must mean you are a very good writer!